A small newspaper in Louisiana has identified one of two men in a photo at an anti-immigrant rally to be a detective for the Lake Arthur (La.) Police Department. A police detective from a small Louisiana town participated in an anti-immigration rally in North Carolina last year sponsored by the Ku Klux Klan, a Louisiana newspaper reported today. Det. 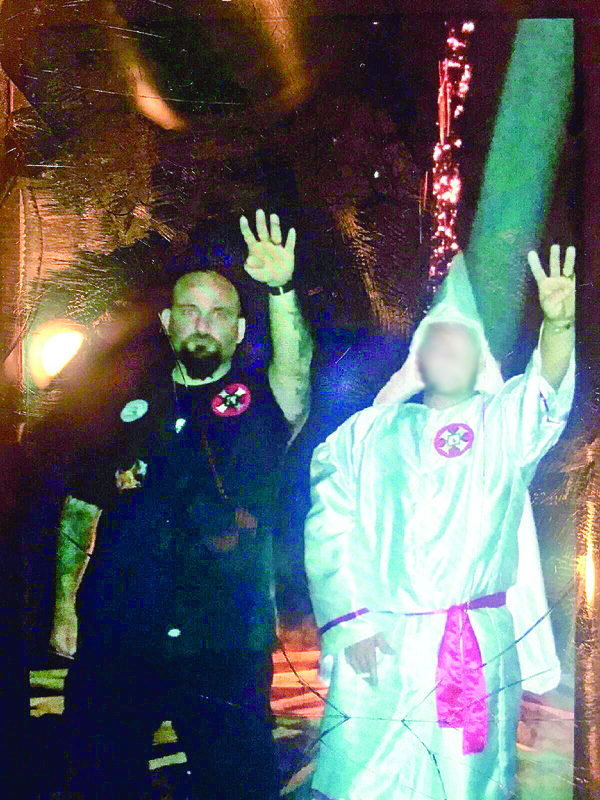 Raymond Mott of the Lake Arthur Police Department confirmed that he is in a photograph of the KKK rally being circulated on the Internet, the Jennings Daily News reported. The photo, reportedly taken at the KKK rally in Troy, N.C., in August 2014, shows Mott wearing a black Klan-style uniform with the tradition KKK “blood-cross” logo. Photo courtesy of the Jennings Daily News. Mott and another man wearing a white, traditional Klan hood and robe, appear in the photo to be giving Hitler-style salutes. The reporters who broke the story for the Jennings, La., newspaper, Aubrey Broussard and Sheila Smith, couldn’t immediately be reached for comment on how they identified Mott and confronted him about attending the KKK rally. Mott “is one of two men in a photograph circulating online that was taken at what he called an anti-illegal immigration rally led by the Loyal White Knights of the Ku Klux Klan,” the newspaper reported. Mott also couldn’t be reached for comment. Ray Marcantel, the chief of the Lake Arthur Police Department, did not return a telephone call from Hatewatch. Lake Arthur is a small community located about 10 miles south of Jennings, in southern Louisiana, about 42 miles west of Lafayette, La.